Most homes in America – 68% to be exact – house an extended family member who is not necessarily a blood relative. Confused about this statistic? To be more specific, 68% of our households are pet owners. Pets bring joy to our lives and become an integral part of the family. Since our pets are so important to our families, it’s essential to make sure they are in a healthy state. Since the communication between animals and humans is thin, it’s important to be able to spot any signs of poor health and address them immediately. Today, I would like to go over signs, actions, and symptoms that could mean your animal is sick. There are many signs to look for in your pet that may mean they are sick. Some of the signs that might mean your animal is ill include a change in activity levels. If your pet seems less active than normal, this might mean your animal is ill. Another sign you will want to look for is a change in appetite. Most animals look forward to meal time; so if you see that they haven’t touched their meal, it might be time for a checkup. You might want to make sure your family friend is using the restroom; checking their bowel movements for discoloration or changes might also give you hints as to their health. The last big sign you might want to look for is any coughing, sneezing, excessive panting, or labored breathing. There can be many different reasons your pet is sick. One of the most common diseases that can be affecting your animal is kidney disease. Dogs and cats are the most common animal that this develops in. 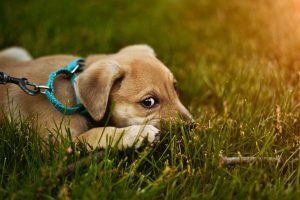 Has your animal been scratching or have they broken out in bite marks? Chances are the animal might have fleas or ticks. The pest can carry serious diseases that can be harmful to you and your pet so it is important to use a monthly flea and tick preventative. Rabies is a serious disease and can be heartbreaking. Although cases are rare, animals still contract this fatal disease. Vaccines for rabies can be found very easily at your local vet to prevent the disease from spreading. Most viruses that are found around the country can be treated with vaccinations. When your pet first joins your family, it’s important to get your them vaccinated. Want more info on what vaccinations are important? Click here. If you see signs that might require a veterinarian, don’t hesitate to take your pet to a clinic. After the vet gives you prescribed medication, make sure you are giving them the correct dosage. If your animal is sick, give them a quiet environment that they can be left alone and rest. Some medicines have side effects, and it’s important to read those to watch for any signs of a reaction. If your pet seems to be getting sicker, alert the vet as soon as possible. Your pet is your best friend, and it’s important to make sure we can make them feel better as soon as possible. Your pet needs to be in the best health possible. That also goes for you. If you need to see a doctor, don’t hesitate. And if you don’t go to the doctor because of costs, give us a call and see how we can help you!